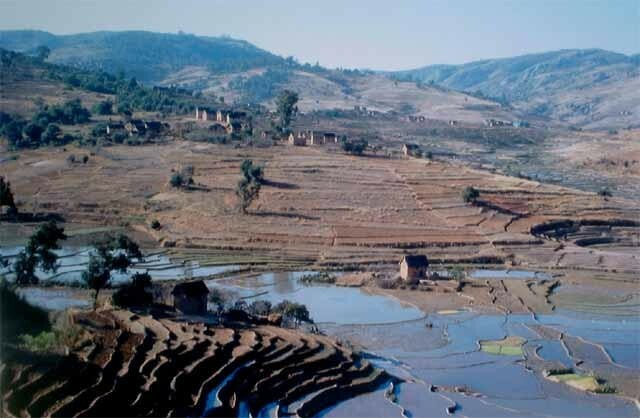 Rice fields are efficient breeding places for malaria vectors in Madagascar. In order to establish as easily as possible if a rice field is an effective larval site for anophelines, we compared classical dipping versus a net as methods of collecting larvae. Using similar collecting procedures, we found that the total number of anopheline larvae collected with the net was exactly double (174/87) that collected by dipping. The number of anopheline species collected was also greater with a net. 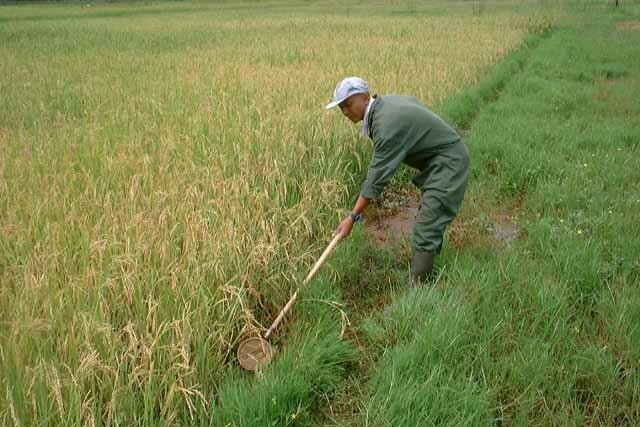 The net is an effective means of collecting anopheline larvae and can be used for qualitative ecological studies and to rapidly determine which rice fields are containing malaria vectors. 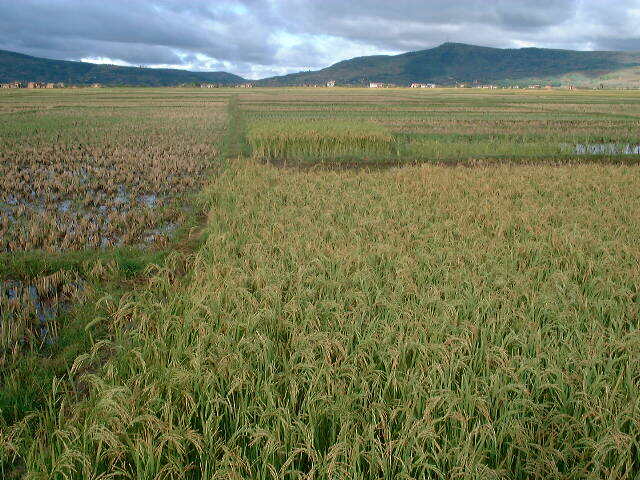 The role of rice fields as breeding places for anophelines has already been established in the highlands of Madagascar [1–3] (Figure 1 and 2). 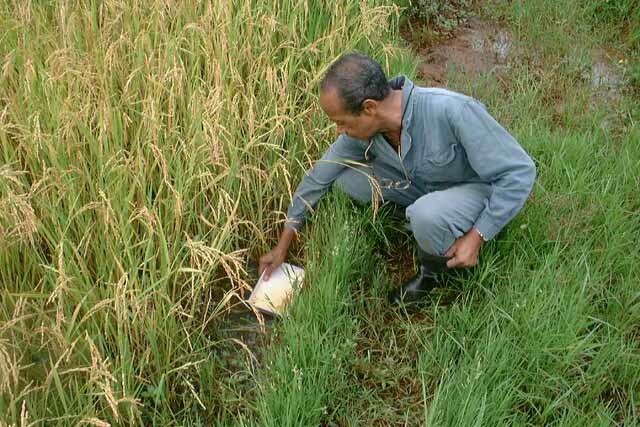 However, the method of collecting anopheline larvae in rice fields has not been addressed. We compared two simple methods to determine which was the most efficient way to collect anopheline larvae from the rice fields. General view of rice fields at the end of rainy season in Madagascar. General view of rice fields at the end of dry season in Madagascar. The first method was based on the classical dipping method with a white tray (20 x 15 x 3 cm)  (Figure 3). The second design consisted of using a small nylon gauze net mounted on a circular frame (15 cm diameter) and attached to a wooden handle (1 m long) (Figure 4). The fine gauze prevents the loss of small larvae. We had initially intended to draw the net through the water for measured distances to estimate larval densities, but the time taken for the bag to become clogged was highly variable, depending on the substrate and the depth of the water. In practice then, the net was drawn through the water until it became clogged with particles and sludge. It was then removed from the water and emptied into a large white tray (30 x 22 x 4 cm). The next-step of both methods was to use a pipette to remove all the mosquito larvae that were at least at the second instar stage. Illustration of the dipping method. Illustration of the net method. The study was carried out by two experienced technicians who simultaneously collected the same rice field for 20 minutes. The larvae were then immediately fixed in 70% ethanol before being studied under the microscope (note that we were unable to classify six of the 2nd instar larvae in the genus Culex to species level). This study was carried out in Madagascar, in the Fianarantsoa province and both methods were repeated three times in different rice fields: Rice field A, 3 km W Amborompotsy, S 20° 36.6', E 46° 16.1', alt 1068 m, Rice field B, 15 km E Amborompotsy, S 20° 35.9', E 46° 19.4', alt 1266 m, and Rice field C, 10 km W Ambositra, 1 km N Andina, S 20° 30.8', E 47° 09.0', alt 1326 m. No vector control programme exists in locations A and B, but the third rice field is located in an area in which DDT has been sprayed for several years. The approximate depth of the water was 5–10 cm. A total of 363 mosquito larvae belonging to three genuses were collected. The results for both collection methods are summarised in Table 1 and exhaustively presented in Table 2 (see additional file: tabl 2 vr.xls). Number of mosquito larvae collected by dipping or with a net in 3 rice fields (locations of the A, B and C rice fields are indicated in the Materials and Method). Given similar conditions a net is a much more efficient way to collect anophelines than dipping. This was the case for the total number of mosquitoes collected, the total number of anophelines collected, the number of each anopheline instar, the efficiency of collecting anophelines and the total number of Culicinae collected but not for the total number of Culex collected. This was also the case for the total number of pupae (results not shown). The total number of anopheline larvae collected with the net was exactly double (174/87) that collected by dipping. Nine Anopheles species and eight Culex species were collected. The anopheline species collected were An. squamosus, An. coustani (or coustani group), An. pretoriensis, An. cydippis, An. gambiae s.l., An. maculipalpis, An. funestus, An. mascarensis and An. rufipes. The first five species were obtained by both collecting methods. An. maculipalpis was only obtained with the net (5 larvae). The three remaining anopheline species were collected at low number: 2 larvae of An. funestus with the net, 1 larva of An. mascarensis with the net, and 2 larvae of An. rufipes among which 1 with the net and 1 with the dipping. It is also noteworthy that the two An. funestus larvae were both collected from rice field B, which contained dense and high rice plants. Conversely the four An. gambiae s.l. larvae were all found in rice field C, which did not contain emergent vegetation and was exposed to the sun. This is fully consistent with the classical characteristics of larval habitats for these malaria vector species. Different results were observed with Culex larvae. Only two of the eight Culex species collected were collected by both methods (Cx. antennatus and Cx. striatipes, with 36 and 2 larvae, respectively), four species were only collected by dipping (Cx. univittatus, Cx. quinquefasciatus, Cx. tigripes and Cx. bitaeniorhynchus, with 5, 3, 2 and 2 larvae, respectively) and two species were only collected with the net (Cx. argenteopunctatus and Cx. poicilipes, with 19 and 3 larvae, respectively). In other words the two collecting methods are complementary for the collection of Culex larvae, and we recommend that both methods be used when focusing on this genus. Data on age structure of larvae were detailed in Table 2 (see additional file: tabl 2 vr.xls). Age structure was significantly different between Anopheles and Culex with the dipping (χ2 = 6.317, df=2, P = 0.042) and with the net (χ2 = 16.701, df=2, P = 0.0002) strongly suggesting that both methods collected older Culex and/or missed younger Anopheles. Age structure was also analysed within each genus by collecting methods. In Anopheles, the comparison of the proportions of each instar relatively to the total collected were always non significant (P = 0.087 by exact Fisher's test for the 4th instar, P = 0.096 for the 3rd instar and P = 0.77 for the 2nd instar). The comparison of the relative proportion of 4th and 3rd instars was near significance (P = 0.053 by exact Fisher's test) suggesting that the net would collect smaller anopheline larvae that were being missed with the dipping; however, the comparison of the relative proportion of 3rd and 2nd instars did not support this interpretation (P = 0.45). In Culex, these analyses were always non significant, indicating a similar efficiency of both methods per age group of larvae. Four species of Uranotaenia sp. were obtained, but the low numbers collected prevented any valuable analysis. These results, which clearly favour the using of the net for collecting anopheline larvae, can be explained by two non-exclusive hypotheses. The volume of water examined was higher with the net. Consequently, the number of materials, including larvae, per tray was much higher (once remembers the net content was emptied into a large tray) and the time spent per tray by the observer was much longer which gave the larvae more time to reach the surface of the water, facilitating their detection with the net method. The question of differences in collecting Anopheles versus Culex remains unclear, but clearly it cannot be related to instars. Because Culex are relatively underrepresented with the net method, an explanation may reside in the specific escape behaviour of these mosquitoes. In conclusion, the net is an efficient and simple way of collecting anopheline larvae. Further studies are necessary to validate this method for quantitative evaluation of larval populations. However, the net can be used for qualitative ecological studies and to rapidly determine which rice fields are containing malaria vectors such as An. gambiae s.l., An. funestus, and at least in Madagascar, An. mascarensis. We thank Donadieu Randrianambinina and Edmond Rajaonarivelo for their helpful contributions in the field and in the laboratory. Dr Isabelle Jeanne kindly provided Figure 1.